Convert Word files to PDF - It's free! Word documents are great, but as an exchange format, a PDF is much better. But how can you convert a Word file into a PDF, so that, for example, you can send your canditature documents as a PDF file to the potential new employer? In the following report, we will show you how easy it is and, most of all, free for private users. In addition, all files, Word documents and converted PDF files remain on your system and are not transmitted online to unauthorized third parties. Most likely another benefit of protecting your data, and safer than trusting any online converter from the web. Convert Word documents to PDF ... very easy with our "PDF Printer"! After the installation of our PDF Printer under Windows 10 / 8.x / 7 / and many other Windows versions you have a so-called virtual PDF printer "7-PDF Printer" at your disposal. 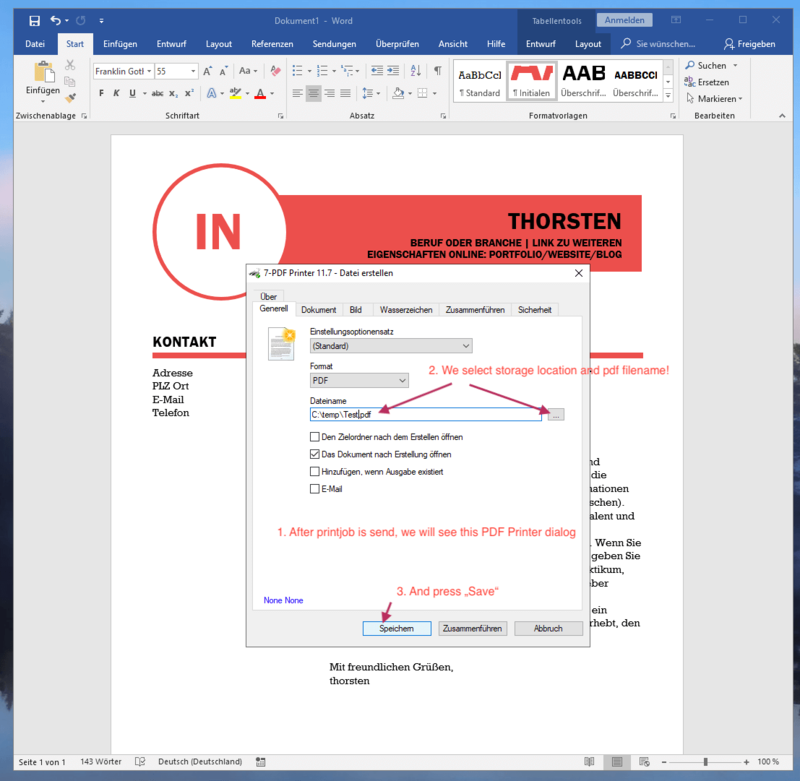 So if you have finished your Word document in Microsoft Word so far, a PDF can be generated directly after installation by unsing this installed PDF Printer. By printing your Word document on the PDF Printer "7-PDF Printer" you convert elegantly and easily your Wordfile into a PDF. The default settings of the PDF Printer are automatically optimized immediately after installation. The PDF file size, PDF compression level and format of the converted PDF document directly fit to send it as an email. For the experts among here, the PDF Printer also provides a whole range of PDF conversion functions, for example, to be able to generate PDF documents with a watermark, backgrounds, PDF security settings and much more. The possibilities to convert Word documents into a PDF are therefore more than versatile via our PDF Printer. Even the digital signing of PDF files is child's play via the PDF Printer directly from Word. 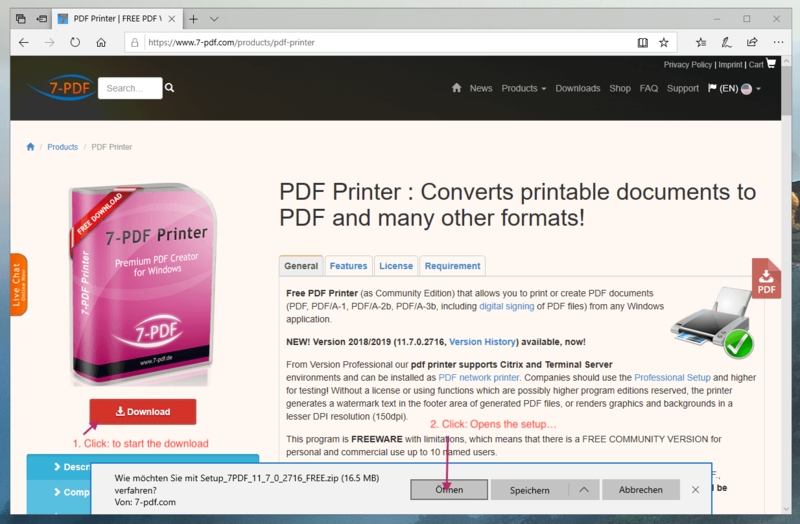 In the following section, we will show you step by step how to install and use the PDF Printer on your Windows PC and then convert your Word file into a PDF file. If you have not already done so, download the PDF Printer setup on this page! We use the Edge Browser under Windows 10 as shown in the screenshot. With a double-click we start the installation of the PDF Printer via the Windows Explorer dialog window displayed after the download. The setup is a zipped archive and contains the actual setup.exe file (installer) as shown in the screenshot. Follow the instructions of the installer ... the following screenshot shows the progress of the PDF Printer installation. 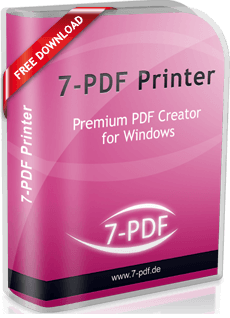 The installer automatically takes care of a perfectly adjusted "7-PDF Printer" on your Windows PC. After installation you will find the virtual printer "7-PDF Printer" among the printers installed on your system. With that we are already finished and can now switch to Microsoft Word to create a PDF from the Wordfile. To do this we change to the printing area in Word. Select "7-PDF Printer" as PDF Printer and "print" the Word document to convert it to PDF. 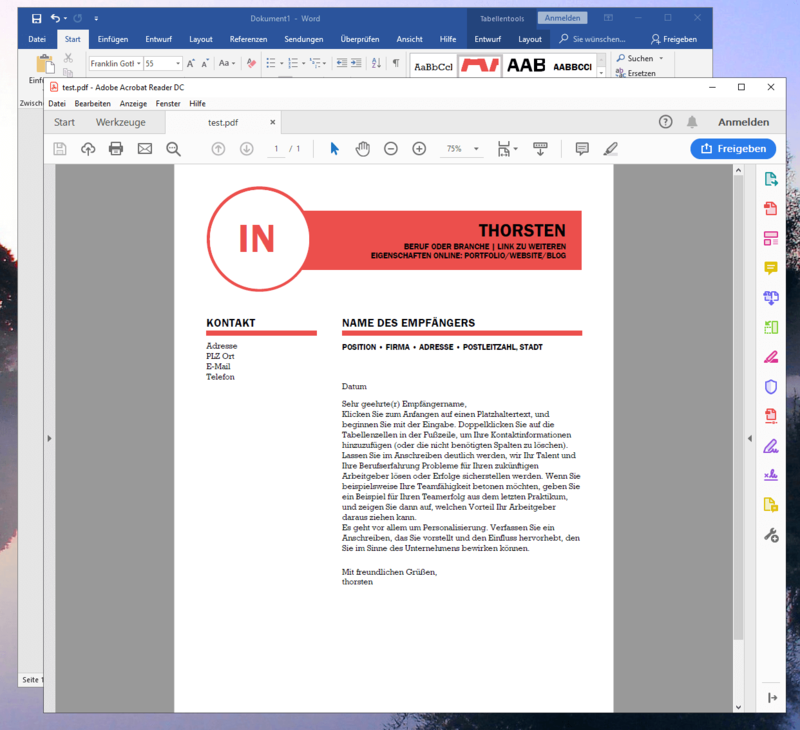 The screenshot below shows the "Printing" section of Microsoft Word 2016 with "7-PDF Printer". After clicking on "Print", the print dialog of the PDF printer appears after a short time to retrieve the storage path and the file name of the PDF document created from Word. After clicking on "Save", the Word document is finally converted into a PDF and appears shortly afterwards in Acrobat Reader or another PDF viewer available on your system to display PDF files. So ready! You have now converted your Word document into a PDF. Was not difficult or? 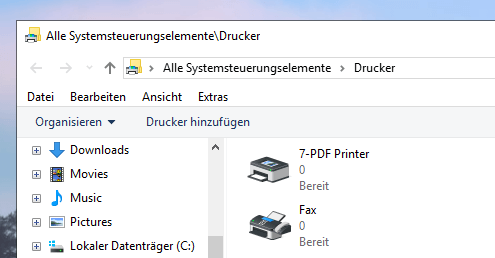 From now on you can use "7-PDF Printer" on your Windows PC to create a PDF using the "Print" function from almost any application. The PDF conversion functions are not limited to Microsoft Word. The path described above works from any application on your PC. For example, to create a PDF from an Excel file and convert a PowerPoint presentation into a PDF. Why do we even use converted PDF files instead of Word documents? Word files are the format of choice when it comes to writing texts, but not very well suited to sharing them securely between computers, smartphones or via email. The PDF format is the measure of all things! But how can I convert my Word documents as elegantly and simply as possible into a PDF file? Optimized as equally as possible so that the PDF size and the PDF compression are equally ideally set so that, for example, sending the generated PDF document directly afterwards by e-mail reaches the recipient accordingly quickly? As application case one could list PDF application documents, or also business letters with watermark and PDF background (letterhead in corporate design of company). With our PDF printer, which you can find and download on this page, we have the appropriate free software (only private users) for you! 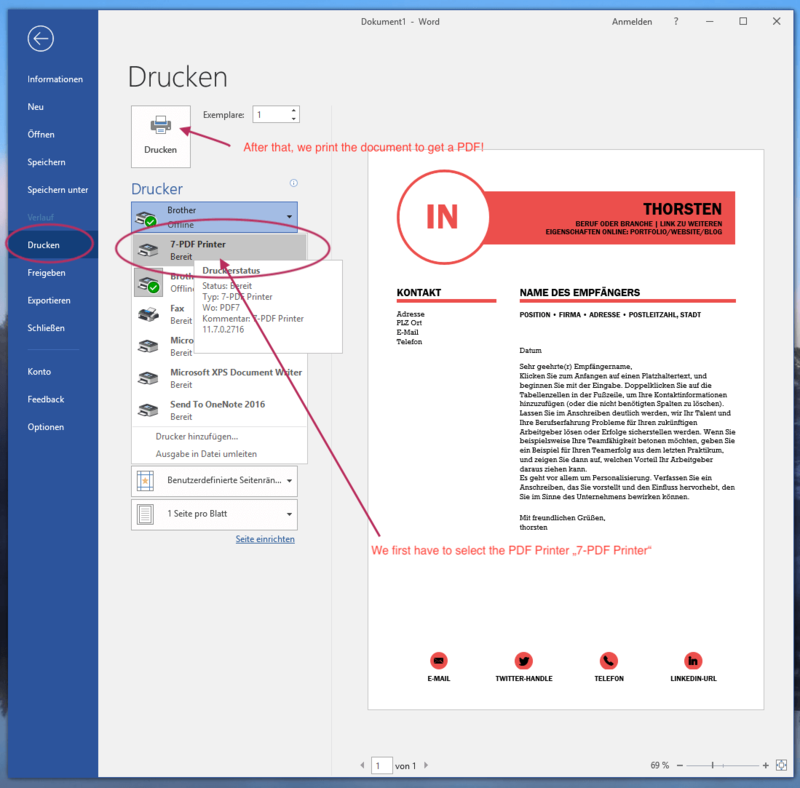 Our PDF Printer not only feels good on Windows 10 / 8.x / 7 desktop systems, and can also be used under all current Windows server systems. In addition to the classic installation, for example as a PDF network printer, the Professional Edition (subject to charge) offers the option of centrally using the PDF printer under Citrix and terminal servers to convert files from SBC applications such as Word, Excel, Powerpoint & Co. into PDF. Finally, one more advantage: Hidden fee-based ABOs when licensing the PDF Printer are not available here!